Blanket The Globe is a volunteer project that promotes environmental awareness through creativity and sewing. Sisters Casey and Jamie Ehrlich founded the project in order “To build awareness, give voice to the environmental concerns of children and, through creative expression, empower them to participate in protecting the earth’s natural resources for their future.” Children from all around the world have helped to decorate fabric squares which in turn are stitched together in panels and displayed in public. 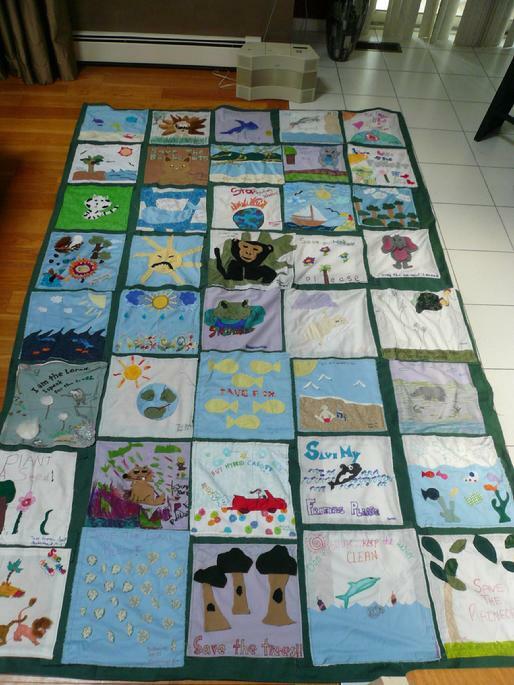 You can help spread the positive message of keeping our planet green and teach kids about environmentalism by helping children create a square for the Blanket The Globe project. This would be a great creative project to do with your own children or grandchildren, kids that you babysit, or even your class if you are a teacher. Learn the specifics about creating squares for the project at the BTG website right here, find the address to send squares here, and have fun clicking around the website gallery to see photos of panels created to date.